Each time there is an anniversary of the Olympic Games in Montreal, Quebec, the Corridart Affair is revived. 2016 marks the 40th anniversary of the Olympic Games, and the film About the Corridart Affair is receiving renewed attention. The film, by Bob McKenna, is being presented in several major exhibitions around Montreal including the Canadian Centre for Architecture, the Maison de la Culture de Maisonneuve in the neighbourhood housing the Olympic installations, and a series of art galleries and the Bibliothèque and Archives nationales du Québec which are featuring a retrospective of the work of Pierre Ayot, one of the artists who led the legal battle against the city. Corridart was a 6-km long public art exhibit of monumental installations (a corridor of art!) created for the 1976 Olympic Games that took place in Montreal, Quebec. The artwork was commissioned by the Olympic organizing committee, and showcased some 60 artists, with hundreds working on the installation along Sherbrooke Street. Just before the opening of the Olympics, on July 13, 1976 at 10 pm with no advance warning, bulldozers and city crews pulled down the art exhibit. The dismantling took three days under police protection. Mayor Montreal Mayor Jean Drapeau had ordered the removal of the artists’ creations, crying, “This is not art!” and the works were tossed into the municipal dump. The mayor’s action was considered outright censorship at the time and possibly the single largest episode of artistic censorship in Canadian history. Most of the works were destroyed beyond repair. The artists undertook a legal battle that lasted 12 years to sue the city for damages. About The Corridart Affair is the story of that battle – over who decides what is art and what is not – a historic confrontation between art and politics, by one of the artists, Bob McKenna, whose work was torn down. 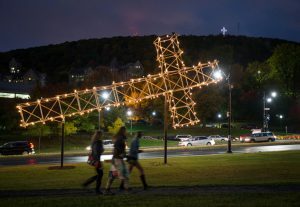 Interestingly, one of artist Pierre Ayot’s major pieces for Corridart, a replica of the cross on Mount Royal lying on its side, sparked new controversy and cries of censorship when it was installed recently on public land at a city intersection near a religious convent in Montreal. The Mayor of Montreal intervened to try to stop it, but with the tempest and cries of censorship that ensued, the city administration backed down. The Croix du Mont-Royal can be seen at the corner of Avenue du Parc and Avenue des pins. It looks best at night when lit up. Looking back and forward to 2017!